Post-1994, South Africa’s traditional leaders have fought for recognition, and positioned themselves as major players in our political landscape. Yet their role in a democracy is contested, with leaders often accused of abusing power, disregarding human rights, expropriating resources and promoting tribalism. Some argue that democracy and traditional leadership are irredeemably opposed and cannot co-exist. Meanwhile, shifts in the political economy of the former bantustans - the introduction of platinum mining in particular - have attracted new interests and conflicts to these areas, with chiefs often designated as custodians of community interests. This edited volume explores how chieftaincy is practised, experienced and contested in contemporary South Africa. 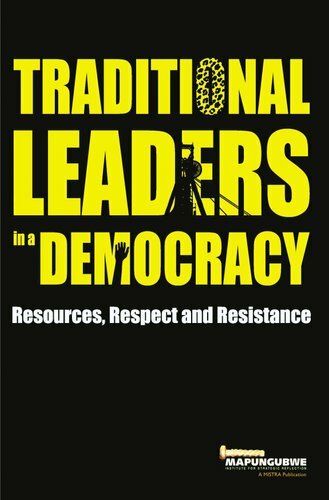 It explores how those living under the authority of chiefs, in a modern democracy, negotiate or resist these politics in their respective areas. Chapters in this book are organised around three major sites of contest in the area of traditional leadership: leadership, land and law.